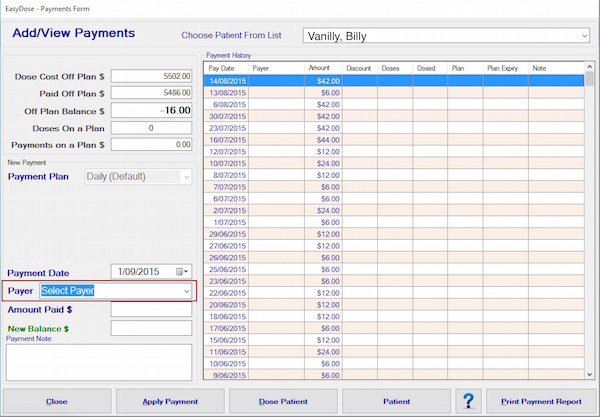 The payments received and the cost of dosing can be recorded in EasyDose. 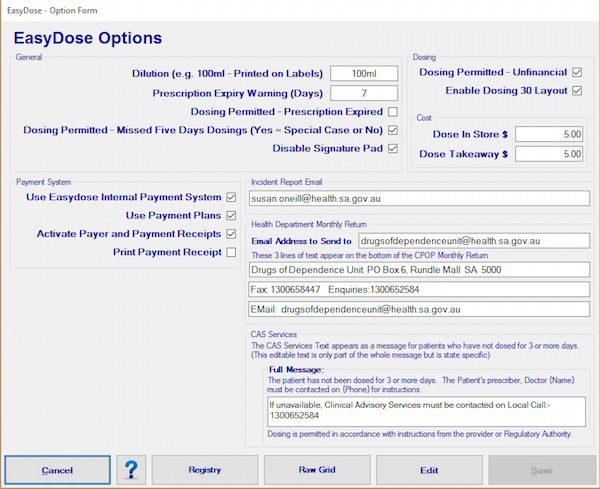 In recognition that some pharmacies wish to record payments outside of EasyDose, the use of the EasyDose payment system can be turned off in the System Options. 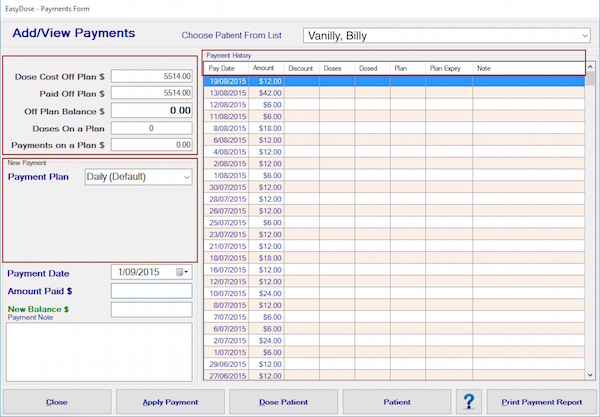 The Payment Form, which lists the full history and allows the addition of payments, can be accessed from the Main Menu > Patients > Add/View Payment or from the Payments button of the Quick Access menu. Functionality of the Payment Form. 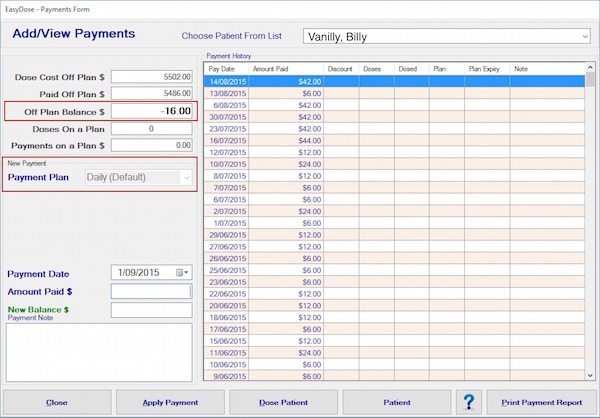 Notes can be entered against each payment which will be recorded in the Payment History grid. This form cannot be accessed, nor can payments be processed, if the payment system is turned off in System Options. When the number of days for which a plan is to be extended is chosen, the system will calculate the amount to be paid and the date the extended plan expires. If the Payer and Payer Report options are turned on in System Options, the ‘Payer’ field, indicated below, appears and is enabled. The Payer details entered into the ‘Payer’ form through, accessed from the Maintenance Menu, will be available in the Payer drop down box on the payment form. Reports can be printed for each Payer. 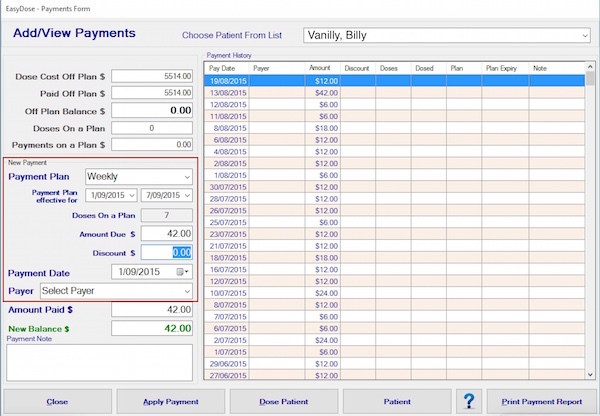 Payment Plan are not possible (field disabled) if the patient is in Negative Balance in Non-Plan payments. DAILY DOSING is not a payment plan and is payment, either in FULL or NOT, for any period of time. PAYMENT PLAN (Weekly/Monthly) is a payment method whereby FULL payment is received for dosing 7 to 28 days in advance AND any MISSED DOSES are NOT credited back to the patient. Any Missed Doses are forfeited within the duration of that plan. Patients cannot be placed on a plan if the ‘Non-Plan’ balance is negative. The Plan drop down option will be disabled. If a plan is not renewed and there is money in credit for Daily Dosing, the system will revert to and allow dosing under the Daily Dosing regime. The system does not dose across payments from a Plan to a Non Plan. In other words, you cannot, WHILE A PLAN IS CURRENT, partially dose from a plan to a non-plan payment. If a patient is to be dosed beyond the expiration of a plan, the “Custom” plan is to be utilised where a plan can be extended from 1 to 6 days. 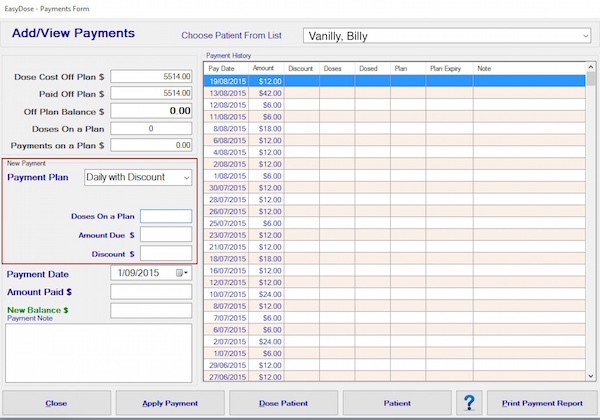 If the patient is making daily Payments, therefore not on a plan, EasyDose functions the same as the previous payment version except for the added choice of applying a discount. This new system of daily payment works whether the Payment Plan is enabled in System Options or not. Missed doses are not automatically debited from the patients account. They remain in credit and will only be deducted from any balance outstanding only when dosed. When making entries for Daily Dosing, the number of doses being purchased must be entered which will then calculate the cost from either the default amount or the patient’s overriding amount. If a discount is applied the system will record the daily discounted rate. This is the first area to be interrogated by the system and is determined from the patient’s overriding set amount or the systems default amount. If no discount applies, the system will interrogate the patients’ overriding set amount and if blank will record the system default amount. Payments/Dosing ON A PLAN is new. For the Plan system to become visible and functional, it must be enabled in System Options. Plans can also accept discounted payments. Missed doses are not recorded anywhere in the system. The system simply looks at the duration of the plan and allows dosing to occur during that period, regardless of missed doses and regardless of the amount paid. When the plan expires, and the patient is to remain on a plan, payment is required again before dosing is permitted. If a plan is for two or three weeks duration A NEW WEEKLY PLAN must be entered for each week. The system will automatically calculate the start and finish date of any subsequent plans. Therefore, paying for two weeks, enter two weekly plans. Additional plans can be added before or after the expiration of any plan but the system will default to the correct subsequent date and not the date of entry. EG patient paid $35 but $45 is accidently recorded, a -$10 value can be recorded against that patient. The correction must be recorded against the same Plan Type, therefore Plan against Plan, date against date etc.